Thomas Jefferson by Jean-Antoine Houdon. Photo taken at the Boston Museum of Fine Arts. 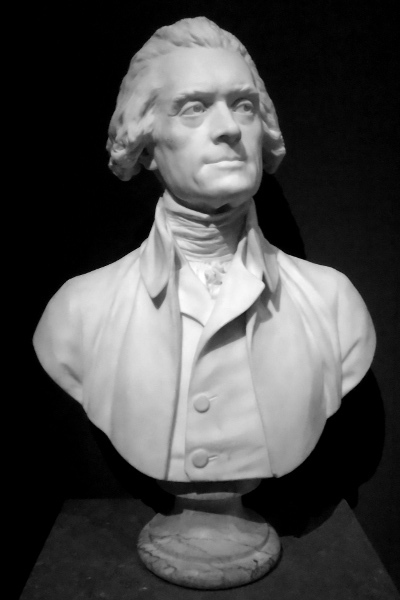 According to the tag there, Jefferson sat for this sculpture just before leaving Paris and thought Houdon was one of the greatest artists in the world. Part of the Place des États-Unis is actually Square Thomas Jefferson. While Jefferson did like Paris, he was always an American at heart. On June 17, 1785 Jefferson wrote to James Monroe when he was sent here: I sincerely wish you may find it convenient to come here. The pleasure of the trip will be less than you expect but the utility greater. It will make you adore your own country, it’s soil, it’s climate, it’s equality, liberty, laws, people \& manners. My God! how little do my country men know what precious blessings they are in possession of, and which no other people on earth enjoy. I confess I had no idea of it myself. While we shall see multiplied instances of Europeans going to live in America, I will venture to say no man now living will ever see an instance of an American removing to settle in Europe & continuing there.